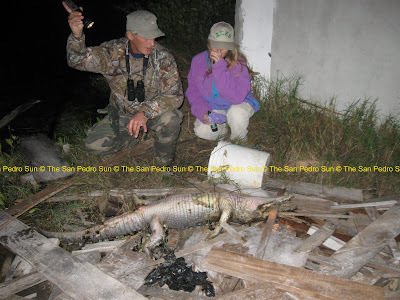 Home » Community and Society » American Crocodile Education Sanctuary to the Rescue! « Older: Sports Action Today! 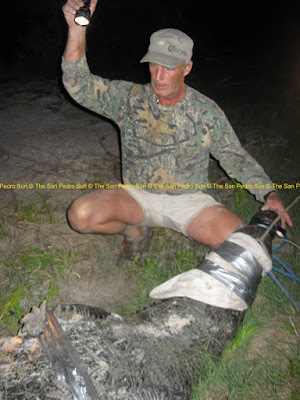 The first nine foot croc was captured Friday afternoon near the DFC area south of San Pedro. 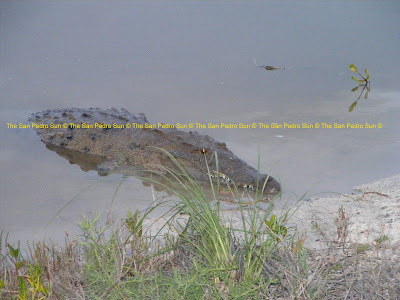 The croc was then located to a holding area until transport could be arranged. 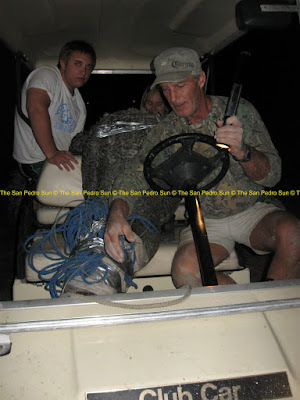 The second croc, a very aggresive 12 foot male was captured around midnight on Friday in the same area. Both crocs were contained to a holding area until they can be transported to ACES on Monday. This video displays how bold these animals have become. 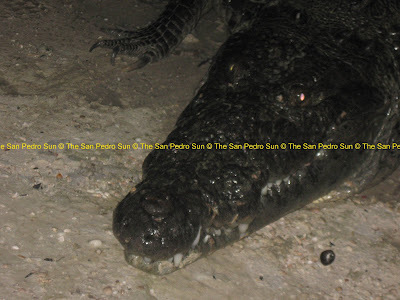 ACES was called by the San Pedro Police to remove a crocodile south of town that was about to be shot. The croc was residing under a family's home and they were living in fear for their children's lives. With permission from the Belize Forest Department, ACES went to the scene only to find the reason for the croc invasion even more alarming. Acres of protected Red Mangrove, prime American Crocodile habitat, is in the process of being destroyed for development, leaving the crocs wondering aimlessly looking for a new home. Additionally, the trenching activities have flooded some of the DFC housing area and resident’s yards were shin deep in water. With the cold temperatures the past few days, the shallow water warms quickly and 9 and 12 foot crocs who just lost their homes couldn‘t resist the new Jacuzzis and possibly an easy meal. These crocs have been hand fed for years by local boys as a tourist attraction and with the abundance of discarded food waste and garbage in the area these animals have learned to associate man as a food source. 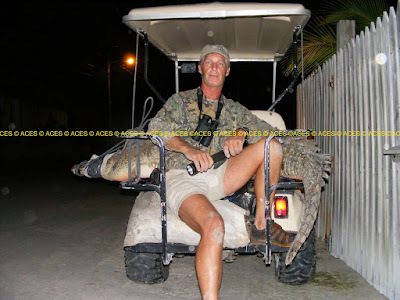 Not only is feeding the crocs illegal in Belize, but feeding wild Apex Predators is a very dangerous practice that leads to problematic animals. These animals soon lose their fear of humans and become beggars and scavengers. A protected species, American Crocodiles are threatened of becoming endangered. ACES captured the nine footer within minutes and later captured a 12 footer as well. While removing the crocs is not a long term answer, at least it saves lives for now. Last night while making sure no more large crocs were in anyone’s yards, ACES discovered a dead 4 footer that died from human hands. It is illegal to kill these animals and anyone needing assistance is asked to please call the police or the BFD. 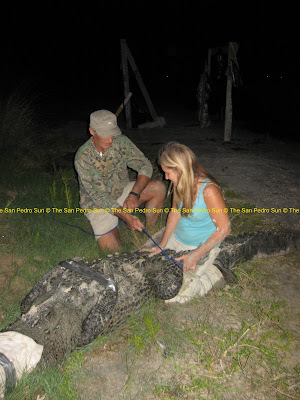 The captured crocs will go by barge to the mainland and be transported by ACES’s truck to the sanctuary in Punta Gorda. ACES is in desperate need of finishing a containment area for the newly captured large 12 foot male. Otherwise, chances are the 12 footer “George,” already residing at ACES will fight with it till death. 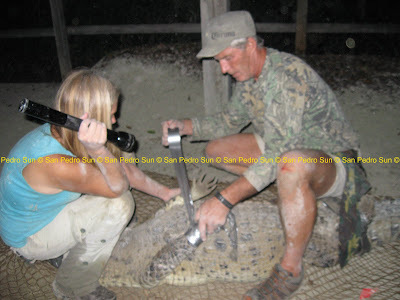 If anyone can assit with funding please go to www.americancrocodilesanctuary.org .